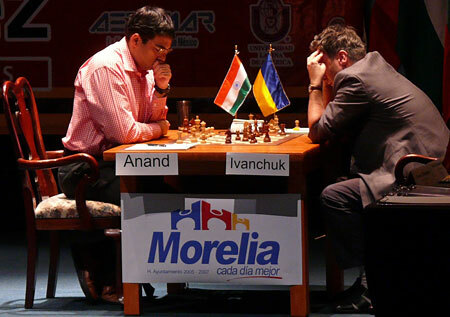 2/25/2007 – Vishy Anand fought it out with Vassily Ivanchuk for 32 moves, with the Ukrainian using up almost all his time to abandon a promising position. 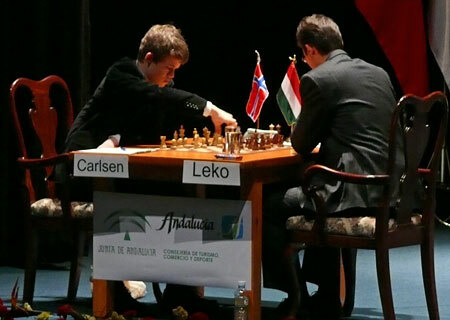 The others essentially took a break: Aronian Topalov drawn in 22 moves, Carlson-Leko drawn in 20, Morozevich-Svidler drawn in 16. 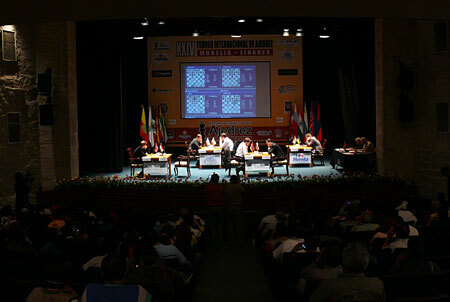 Pictorial report with analysis by GM Mihail Marin. 1.d4 d5 2.c4 c6 3.Nf3 Nf6 4.Nc3 e6 5.e3 Nbd7 6.Qc2 Bd6 7.b3 0-0 8.Be2 b6 9.Bb2 Bb7 10.0-0 Qe7 11.Rad1 Rad8 This is the most natural way to develop the queen's rook. 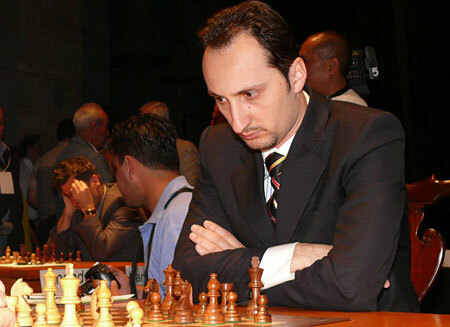 One round earlier, Topalov preferred to place it on c8. 12.Rfe1 Rfe8 13.e4 Nxe4 14.Nxe4 dxe4 15.Qxe4 Bb4 16.Rf1. 1.c4 e5 2.Nc3 Nc6 3.Nf3 Nf6 4.d4. One of Botvinnik's favourite in the past, this line is not too fashionable today. 4...exd4 5.Nxd4 Bb4 6.Bg5 h6 7.Bh4 Bxc3+ 8.bxc3 Ne5 9.f4 Ng6 10.Bxf6 Qxf6 11.g3 Nf8 12.Bg2 Ne6 13.0-0 0-0. 1.d4 d5 2.c4 c6 3.Nf3 Nf6 4.Qc2 dxc4 5.Qxc4 Bf5 6.g3 e6 7.Bg2 Nbd7 8.0-0 Be7 9.Nc3 0-0 10.Re1. 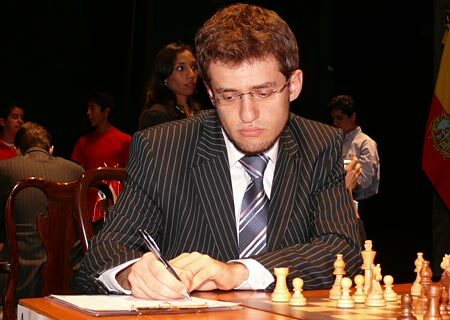 After his game against Anand, Aronian had no special reasons to refrain from this variation. 10...Bg6!? 10.h3!? A new move. White intends to take advantage of Black's delaying ...b5 by carrying out the standard g4 by other means than an early f3. The f-pawn is reserved a different fate. 10...b5 11.g4 0-0. Eliminating the central pawn with 11...b4 12.Nd5 Nxe4 is not without strategical risk. After 13.Qxb4 Bxd5 14.Rxd5 Nef6 15.Ra5 the weakness of the light squares leaves Black with problems consolidating. 12.Kb1 Qc7 13.Bg2 Nb6 14.Bxb6 Qxb6 15.f4 Bc4 16.g5 Nh5 17.fxe5 dxe5 18.Nd5 Bxd5 19.exd5 Bd6. This is the position both sides have been aiming for. White has more space, but the impetuous advance of his kingside pawns have left numerous weaknesses behind. 20.Na5. This looks more like a defensive move (preventing the advance of the a-pawn) rather than an attempt to activate White's play. Indeed, the knight's efficiency on c6 would be questionable. The optimal regroupment for White would involve the transfer of the knight to e4, in order to safely block the e5-pawn and put the d6-square and the enemy kingside under pressure. However, this manoeuvre is not easy to achieve, because the best placement of the queen is precisely the d2-square. For instance, after 20.Qe1 Black can radicaly prevent White's plan with 20...e4!? when 21.Bxe4 Ng3 reveals the main drawback of Anand's novelty, the weakness of the g3-square. 22.Rg1 Rfe8 Black's activity has reached alarming heigths and White will soon lose the exchange. 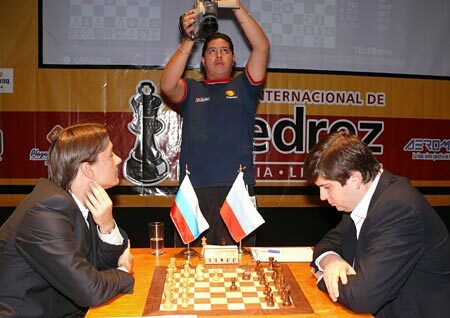 23.Nd2 Qd4 24.c3 Qe5 25.Bc2 Qf4 . The white queen is trapped, which forces 26.Qxg3 , leading to a small material advantage for Black. 20...f5 21.gxf6 Rxf6 22.Rhf1 Re8 23.Rxf6 Nxf6 24.Nb3. Now that the danger of ...a5 has dissapeared, the knight hurries to join the rest of his army, freeing the queen from her defensive task. 24...e4 25.Nd4 Re5 26.c3 Qc5 27.Qe2 Nxd5 28.Bxe4 Nf6 29.Nb3 Qc7 30.Nd2 Qe7 31.Qd3 Bc5 32.Bg2. Tired of all the same old boring pictures of men staring at boards, trying to rearrange pieces of wood better than each other? Once again we caught our two friends in the press room, discussing arguably more interesting subjects. And proving that they have have an unlimited supply of topics to go through. ...which means that this animated conversation took place en Español.